Welcome to Propertymark Qualifications, the UK's specialist awarding organisation offering national, industry recognised qualifications in property and property related disciplines. Drawing on our expertise from an array of experienced property industry practitioners and academics from relevant fields, including property, law, surveying and finance. 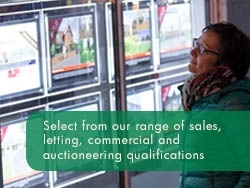 Propertymark Qualifications is uniquely positioned to provide relevant, tailored, specific qualifications that meet industry requirements, reinforce industry standards and afford individuals the opportunity to enter into the property industry or continue their career and professional development.